Good skin care is essential to aging gracefully. Over time harsh elements in the environment cause the skin to become thicker and drier. Good skin care can slow down the harmful effects of time and the environment. One of the most important ways to take care of your skin is to protect it from the sun. Exposure to the sun without adequate protection can cause wrinkles, age spots and other skin problems. At Renaissance we have a variety of innovative treatments for the face and body. Our professional client care and scientifically researched skincare ensure client satisfaction. The Environ Skin Care Institute Team consists of senior skincare therapists with varied backgrounds which include medical clinic, spa, hydro, hotel and cruise liners. Along with all the combined experience in the spa and beauty industry, the team has worked with Environ Skincare collectively for many years and is extremely knowledgeable and passionate about this world renowned, award winning, results-driven product! This combination offers a dynamic team who specialise, not only in the phenomenal DF Machine Treatment facials, but in all aspects of skincare therapy. 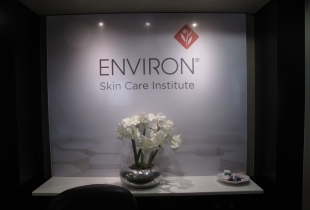 Whether you are already an Environ Skin Care user or are interested in discovering the benefits of this exceptional skincare product range, we invite you to pay the Environ Skin Care Institute team a visit and let us assist you with your skincare regime. At Environ Skin Care Institute we specialise in offering you luxury treatments to assist in achieving the most desirably smooth and radiant skin. By harnessing the unique power of Environ’s DF Machine, surging electrical pulses and magical tones harmonise your skin cells and build beauty from within. It is well known that the greatest achievements come only from persistent and continuous small steps, the Environ Skin Care Institute team is there to assist you this meticulous and rewarding journey. We specialise in the world renowned Environ DF Facial Treatments’ which comprises of the unique combination of Sonophoresis and Iontophoresis on specific/targeted areas. This combination of treatment allows us to reach between 400-4000% penetration of Active serums, specifically chosen for your treatment. Along with offering the general list of therapy treatments… Pedicures, manicures etc. Kindly call to make an appointment.